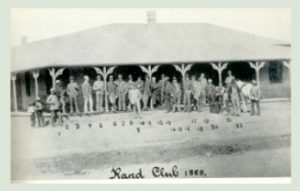 Rand Club was founded in October 1887, a year after the establishment of the new township of Johannesburg. Prior to the sensational discovery of gold, this stretch of veld and farmland a mile above sea level was windswept and largely treeless. The Witwatersrand (White Waters Ridge) was home to the farm Langlaagte and when traces of gold were found in a rocky outcrop on the farm property in February 1886, samples of the rock were sent to Kimberley to be assayed. Finding the results of the gold-bearing rock to be satisfactory, Cecil John Rhodes asked Dr Hans Sauer, the first district surgeon of Johannesburg, to return to the Rand and obtain options for ground. In December 1886, after completing some business, Rhodes suggested to Sauer that they should take a walk around the new town layout and select a site for a club. After walking for some time Rhodes suddenly stopped and said, “This corner will do for the club”. This was at the point where Commissioner Street met Loveday Street, running from Marshall’s township into Market Square. The site consisted of four stands, and Sauer was instructed to find out who these stands belonged to and buy them. Sauer discovered that two of the stands belonged to Ikey Sonnenberg, a financier and speculator. Upon being told that Rhodes wanted to buy the stands as a site for a gentlemens’ club, Sonnenberg immediately offered his two stands as a gift for this purpose. The other two stands belonged to a Scotsman called H.B. Marshall, to whom Sauer paid £72 for his stands. The first Rand Club was built with shares of £10 purchased by each candidate wishing to become a member, and thus the money required for building the clubhouse was raised quickly. The first clubhouse was a modest brick and thatch pavilion consisting of a single floor, but it offered welcome respite from the harsh elements in the new mining town. It served its purpose until 1889, after which it was levelled and a more commodious clubhouse was erected. The second clubhouse was built on the same site as the first, but had grown to be an elaborate two-storey structure. Its soaring turret was one of the tallest structures in Johannesburg at the time. It accommodated a bar, billiards room, large dining room, four small rooms, a kitchen, scullery, and various offices, and the members took possession of the second clubh ouse on February 1st, 1890. The style of architecture was English Renaissance with ornate wrought iron work on the balconies, popular for observing passing life at the time. It was in the second clubhouse that the foundations of the present library were laid. An Africana section was managed by Henry Stratford Caldecott, whilst the English books were the charge of a committee under Frank Lowrey. 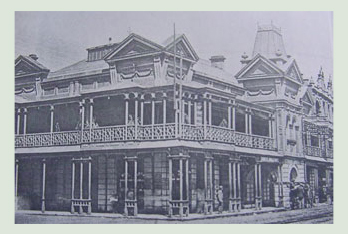 After the Anglo-Boer war ended on May 31st, 1902, a valuation of the second Rand Club building was made. There had been an underlying feeling amongst the club members that the second clubhouse would not meet the needs of the future, and in the last quarter of 1902 action was taken to update the structure. Four sets of plans for a new clubhouse had been obtained before the war at a cost of £400, and after these were considered by the Committee, it was decided that Leck and Frank Emley, the architects of the Johannesburg National Bank Building, would be awarded the job of designing the third clubhouse. The clubhouse as it stands today was first occupied in December 1904. Its metallic base structure was fabricated in the United Kingdom before being shipped to South Africa where it was erected and clad in brick and concrete. When inspecting the clubhouse, one is still able to find evidence of systems that were well ahead of their time. A state-of-the-art central vacuum cleaning system was installed in the club, with the vacuum connection points still visible throughout the building, and the lift was installed in 1904. Though the lift motor has changed, it is still in its original form, and up until the fire of June 20 05, was still operated manually. Two new benches outside the main entrance were presented to the club in 1907 by Dr Schultze, and these were much enjoyed by the Front Porch Benchers, who liked to sit and watch the passers-by. The benches were destroyed by striking miners in the year 1913, but were immediately restored and can still be found in front of the Club today. The exterior of the present clubhouse has changed very little over the years and is very much as it was in 1904, although the building received a major refurbishment following the fire of June 2005. Its top floor, comprising additional bedrooms and a roof area, remains unrestored and presents an exciting opportunity for future redevelopment. The central point of the club remains the magnificent stained glass dome above the staircase and first floor surrounds, which was completely destroyed in 2005. The Club’s committee decided to have this dome restored complete with new stained glass designs. The reinstated dome unfortunately showed structural defects in its leaded glass, and has temporarily been removed for safekeeping whilst funds are raised to restore it properly. 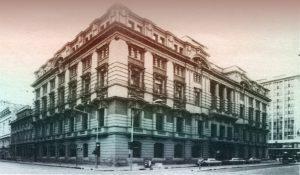 Rand Club’s colourful and often dramatic history is closely linked with the fortunes of the world’s greatest goldfield and the emergence of modern democratic South Africa. It has figured in political upheavals in which it officially took no part. In January 1896 many of its leading members, men of the Reform Committee, were arrested and later sentenced for high treason for their part in planning the Jameson Raid against President Paul Kruger’s government of the Zuid-Afrikaansche Republiek. Rand Club was besieged by striking miners during the 1913 Miners’ Strike and its defence led to fierce street fighting, the scars of which can still be seen on the clubhouse facade. The Club has wielded great influence in times of crisis and despite numerous changes of government and social norms, it has unflinchingly asserted its place in Johannesburg life. In recent years, the Club has weathered financial storms and the relocation of major businesses away from Johannesburg’s CBD. Despite this, Rand Club remains a Johannesburg institution, proud of its place in the heart of the City, and part of the exciting rejuvenation of central Johannesburg. Today, Rand Club is representative of contemporary South African society and is open to everyone who shares in its ethos, regardless of gender, race or creed.